Preheat oven to 325°F. Spray each cavity of a 12-count mini cheesecake pan well with nonstick cooking spray and set aside. You may also use a regular 12-count muffin pan, I suggest lining each cavity with cupcake liners for easier removal. Add the Oreos to a blender or food processor and process until you have fine crumbs. Scoop the crumbs into a mixing bowl and add the melted butter. Mix together until all of the crumbs are moistened. 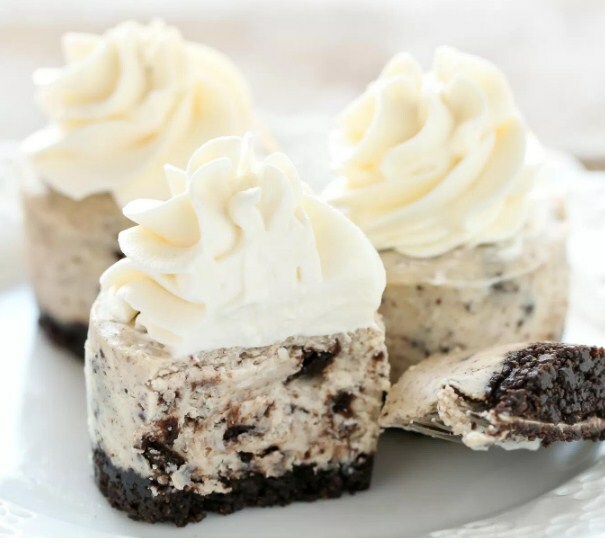 Evenly distribute the filling between all 12 cavities in the mini cheesecake pan, making sure to press each one down firmly into one even layer. Bake at 325°F for 5 minutes, remove from the oven, and set aside to cool. Keep oven temperature at 325°F while you make the filling. In the bowl of a stand mixer fitted with the paddle attachment, or in a large mixing bowl using an electric mixer, add the cream cheese and mix until smooth. Add in the sour cream, granulated sugar, and vanilla extract and continue mixing until well combined, scraping down the sides of the bowl as needed. Add in the egg and mix on low speed until just combined, then gently fold in the crushed Oreos. Evenly distribute the cheesecake filling between all 12 cavities of the pan and return to the oven. Bake at 325°F for 15-17 minutes or until the tops of the cheesecakes are set. Remove from the oven and allow to cool at room temperature for at least 1 hour. Cover tightly with plastic wrap and transfer to the refrigerator to chill for at least 2-3 hours or overnight. Once the cheesecakes are chilled remove them from the pan, serve, and enjoy!